Today, the player affectionately known as “Iggy”, officially hung up his skates after an illustrious NHL career that spanned 20 years, during a press conference at Scotiabank Saddledome. It only seemed right for the St. Albert, Alberta native to return to his home province once more to depart from the game with the franchise he captained for nearly nine seasons, and for which he was a six-time NHL All-Star (2002, 2003, 2004, 2008, 2009, 2012). It’s no small feat to enjoy such longevity in a career, and it’s even more rare to remain as adept as Iginla did up throughout his career. Iginla amassed 625 goals and 675 assists as part of those 1,300 points in 1,554 games while cementing his legacy as one of the best power forwards of his time. He reached the 40-goal mark four times over his career while touching 50 twice as part of a run of 11 consecutive seasons with more than 30 goals scored. Iginla was also named to the NHL First All-Star Team three times (2001-02, 2007-08, 2008-09). His dominance on the ice, and the infectious smile off of it when dealing with fans, reverberated through generations of NHL players to come. His time in Calgary was marked with dazzling skill and the accolades to back it up. Iginla won the first Maurice “Rocket” Richard Trophy of his career in 2001-02 by leading the league with a career-high 52 goals, while his 96 points that season also led the league in scoring for him to capture the Art Ross Trophy. Iginla's play that season also culminated in earning the Ted Lindsay Award (formerly known as the Lester B. Pearson Award) for being voted the season’s most outstanding player by his peers. He was just three first-place votes shy of winning the Hart Trophy as the league’s MVP after tying in total votes with eventual winner, Jose Theodore. It was just the beginning for Iginla. In 2003-04, Iginla led Calgary to Game 7 of the Stanley Cup Final in his first year of captaincy after being named the 18th captain in franchise history. He posted 22 points (13-9-22) over 26 postseason games while leading all playoff scorers. “Iggy” also closed out that same season with his second Maurice "Rocket" Richard trophy as the league's leading goal scorer, along with the 2003-04 NHL Foundation Player Award and King Clancy Memorial Award. On the international stage, he was just as formidable. Iginla represented Canada three times at the Olympic level and won two gold medals (2002, 2010). Canadians will always remember his assist on Sidney Crosby’s overtime game-winning "golden goal" at Vancouver 2010. Iginla also helped Canada win the 2004 World Cup of Hockey championship by scoring three points in six games. 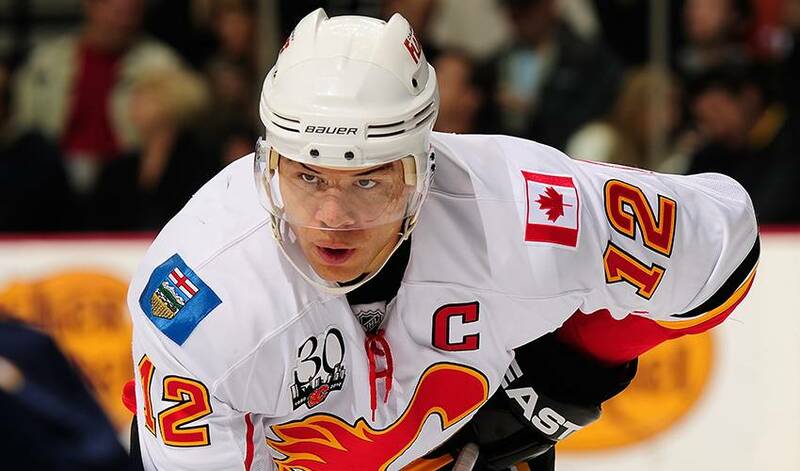 There is no doubt that wearing the ‘C’ for Calgary was an honour that Iginla took seriously. That it came from long-time friend, teammate, and predecessor as captain made it mean even more. Iginla opens up about being named captain and more in this throwback to Be A Player, The Hockey Show, originally aired January 19, 2004. We’ve gathered some of Iginla’s biggest accomplishments and best smiles in the gallery below.